Top Rated Touch-screen Blenders – This is a roundup of the top rated touch control Blendtec and Vitamix blenders, available in 2017-2018. The touchscreen controls on these blenders allows you to use your finger just like a smartphone screen to control your blender. The capacitive touch control surfaces are flat, making it easy to clean. Smart-Review limits the selection to only those blenders with the highest consumer reviews. 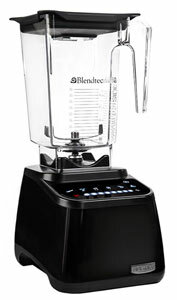 Blenders can be used to chop, mix, and blend ingredients for a variety of recipes. These touch screen blenders have Longer 7 or 8 year warranties, and are better constructed and have more power than cheaper blenders. They have commercial quality motors. They also have pre-programmed touch buttons to make Smoothies, Soup, and other pre-timed blendings. These blenders have the highest consumer reviews, and the power and blade design to make great smoothies without the grit left behind by cheaper blenders. Below is a comparison chart of the top rated touch controlled blenders available, comparing their differences, price, top model features, and consumer reviews. Touchscreen Blender = A new type of blender using the same capacitive touch technology as your smartphone, has arrived. The controls are easy to use with your finger, and because the touch surface is flat, is easy to clean. This also gives a striking attractive look to the blender whether it is on or off. Powerful Motors = All Blendtec Blenders come with powerful 3 HP Motors. This kind of power can pulverize just about any kind of food, ice, greens that you throw at it. To put this in perspective, a low end home garbage disposal only has a 1/4 HP motor. Certified Refurbished Blendtec = Certified Refurbished means that these Blendtec blenders have passed inspection and meet the stringent standards that Blendtec holds for all their machines. With a full 7-year warranty, these discounted reconditioned blenders will perform for many years. SmartBlend Technology = The Designer 725 Blendtec blenders have SmartBlend, which will detect potential problems while blending, that could interfere with the perfect blend-including loading errors, overheating, or air pockets, the blender will then tell the user how to fix the problem.